One of my beautiful nieces will be celebrating her birthday early in the New Year. I've finally learned to make her card early enough to reach her despite Holiday mail times! 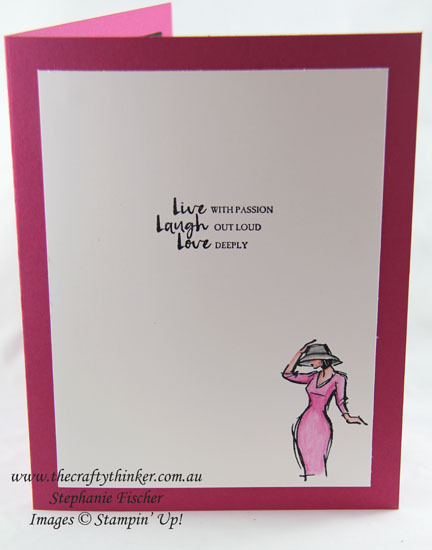 This gorgeous lady is from a stamp set in the 2017 Occasions Catalogue called "Beautiful You"
The focal image of the dancing lady is stamped with Basic Black ink onto Shimmery White cardstock and coloured with Watercolour Pencils and an Aqua Painter. I then used the "out of the Box" technique to die cut her with one of the circle Stitched Shapes dies - leaving her lovely long limbs free to dance. This piece is glued onto a piece of Basic Black cardstock cut with the largest of the Layering Circles framelits. The sunburst is die cut using Silver Glimmer Paper and then adhered to a piece of Basic Gray cardstock. I added a Basic Black mat and then adhered it to the base Rose Red base card (I actually wanted to use Melon Mambo but I'd run out of 12" square card in that colour!). The base card is quite large at 8" x 12" folded in half to make 8" x 6". The greeting is stamped in Basic Black onto Rose Red card and cut out with a square Stitched Shapes Framelit - coverted to an oblong. I used the same method to create a Basic Black mat for it. Not used to making such large cards, I felt the need to fill in some space with another image from the set! I stamped another greeting from the same stamp set inside the card and another of the beautiful ladies.